a diffusion process through the alveolar and capillary cell walls (fig. 3-37). The LUNGS are cone-shaped organs that lie in the thoracic cavity. Each lung contains thousands of alveoli with their capillaries. The right lung is larger that the left and is divided into superior, middle, and inferior lobes. The left lung has two lobes, the superior and the inferior. The PLEURAE are airtight membranes that cover the outer surface of the lungs and line the chest wall. They secrete a serous fluid that prevents friction during movements of respiration. Pleurisy is a painful inflammation of the pleural lining. The MEDIASTINUM is the interpleural space between the two lungs. It extends from the sternum to the thoracic vertebrae and from the fascia of the neck to the diaphragm. It contains the heart, the great blood vessels, the esophagus, a portion of the trachea, and the primary bronchi. The DIAPHRAGM is the primary muscle of respiration. It is dome-shaped and separates the thoracic and abdominal cavities. Contraction of the muscle flattens the dome and expands the vertical diameter of the chest cavity. The INTERCOSTAL MUSCLES are situated between the ribs. Their contraction pulls the ribs upward and outward, resulting in an increase in the transverse diameter of the chest (chest expansion). INHALATION is the direct result of the expansion caused by the action of the diaphragm and intercostal muscles. The increase in chest volume creates a negative (below atmospheric) pressure in the pleural cavity and lungs. Air rushes into the lungs through the mouth and nose to equalize the pressure. EXHALATION results when the muscles of respiration relax. Pressure is exerted inwardly as muscles and bones return to their normal position, forcing air from the lungs. Figure 3-37.Pulmonary exchange at alveoli. The rhythmical movements of breathing are controlled by the respiratory center in the brain. Nerves from the brain pass down through the neck to the chest wall and diaphragm. The nerve to the diaphragm is called the phrenic nerve; the nerve to the larynx is the vagus nerve; and those to the muscles between the ribs are the intercostal nerves. The respiratory center is stimulated by chemical changes in the blood, especially if it becomes acidic. 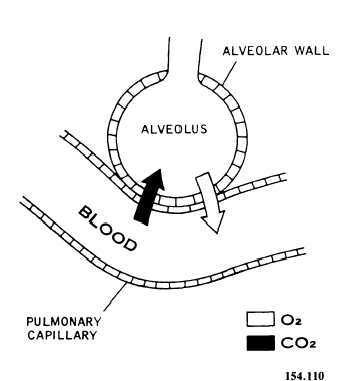 When too much carbon dioxide accumulates in the blood stream, the respiratory center signals the lungs to breathe faster to get rid of the carbon dioxide. The respiratory center can also be stimulated or depressed by a signal from the brain. For example, changes in ones emotional state can alter respiration through laughter, crying, emotional shock, or panic. The muscles of respiration normally act automatically, with normal respiration being 14 to 18 cycles per minute. The lungs, when filled to capacity, hold about 6,500 ml of air, but only 500 ml of air is exchanged with each normal respiration. This exchanged air is called TIDAL AIR. The amount of air left in the lungs after forceful exhalation is about 1,200 ml and is known as RESIDUAL AIR. The existence of this reserve is the basis for administering the abdominal thrust maneuver, described in the chapter entitled First Aid and Emergency Procedures. In this lifesaving procedure, the residual air is used to force a foreign object out of the trachea. EUPNEA is ordinary quiet respiration.